Tiger Woods clinched his fourth Masters and ninth major title with a play-off win over a dogged Chris DiMarco on a dramatic final day at Augusta. The 29-year-old sealed victory on the first extra hole after squandering a two-shot lead with two holes to play. Woods resumed his third round four strokes behind DiMarco but a 65 set up a three-shot lead with 18 holes left. 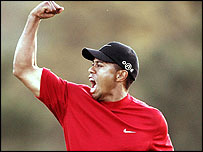 The victory gave Woods his first major title since the 2002 US Open and regained his world number one spot. Woods carded a final-round 71 after finishing with two bogeys to DiMarco's 68 but he drained a 15-foot putt on the 18th hole in the play-off for the title. "That was a hard-fought week with the rain delays," said Woods. "I didn't get off to the greatest of starts. "Chris is a tough competitor and a fighter. He's never going to back off and he proved that again." DiMarco, who lost in a play-off to Vijay Singh in last year's USPGA, said: "This was a good gut check for me. I felt like I proved a lot to myself." Retief Goosen and England's Luke Donald ended on five under with defending champion Phil Mickelson on three under. Former champions Mike Weir, of Canada, and Fiji's Singh, who relinquished his top spot in the world ranking, ended on four under alongside Australia's Rod Pampling and Mark Hensby. World number three Ernie Els, runner-up last year, ended a miserable tournament on 10 over. Woods, who carded rounds of 74, 66, 65, 71, equalled Arnold Palmer's mark of four Green Jackets, two behind the record of Jack Nicklaus. And he moved level on nine major victories with legendary American Ben Hogan and South African Gary Player. Only Walter Hagen (11) and Nicklaus (18) have won more. Woods, who has won all his majors from the front going into the final round, also triumphed at the Masters in 1997 - when he won by a record 12 shots aged 21 - 2001 and 2002. Woods' path to glory began when he resumed his third round at nine under par on the 10th after bad light stopped play on Saturday following lengthy weather delays. 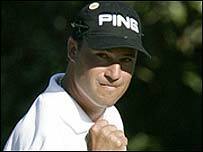 He promptly added four straight birdies to equal the Masters record of seven in a row, set by Steve Pate over the same string of holes in 1999. Woods was on target to eclipse Nick Price and Greg Norman's course record of 63, before stuttering with bogeys at the 14th and 15th. But he ended with three pars for 11 under, three ahead of DiMarco and four clear of Denmark's Thomas Bjorn. DiMarco's demise began at his first hole, the 10th, with a double bogey to end his run of 44 bogey-free holes and he went on to card a 74. But the 36-year-old, who shot a closing 76 last year after sharing the 54-hole lead with Mickelson, made Woods work hard for his victory as the pair were left to fight it out between themselves as Bjorn slumped to an 81 for two over. DiMarco missed a host of birdie putts on the front nine but finally narrowed the lead to one by the 11th with a second birdie in three holes after Woods had dropped a shot at the 10th. Woods stretched back to two clear when DiMarco bogeyed the 12th at the heart of Amen Corner. But a stunning approach on 14 set up a birdie for DiMarco to Woods' par and dragged the gap back to one. A pair of birdies at the long 15th preceded astonishing scenes on the short 16th. DiMarco drove to the heart of the green as Woods dragged his approach to the left fringe. But Woods conjured up a sensational chip shot, using the steeply-sloping green to roll the ball right-angled into the hole. DiMarco missed his putt to re-establish Woods' two-shot lead but he made amends at the 17th when Woods' errant tee shot set up a bogey. On the 18th, DiMarco's approach dribbled off the front of the green as Woods found the right bunker with his second. DiMarco's chip caught the rim of the hole but stayed out before Woods missed his 12-footer for victory, leaving his opponent to hole to set up the play-off.